After U.S. Embassy Move, What Actually Changes For Israelis And Palestinians? : Parallels Have the past week's developments changed anything in their conflict? Demands are the same and impasses remain, but the United States' role in potential peace talks appears to be shifting. Palestinians set tires on fire, as Israeli soldiers attempt to prevent protesters from breaking through the Gaza-Israel border. 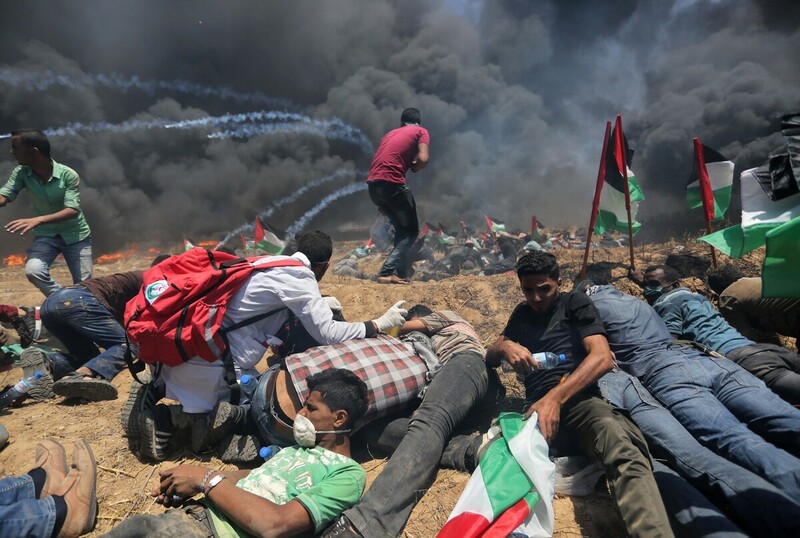 The demonstration marked the 70th anniversary of Nakba, or catastrophe, a commemoration of the displacement of hundreds of thousands of Palestinians in the war surrounding Israel's creation. It has been a week of dramatic developments in striking juxtaposition for Israel and Gaza. On Monday, several hundred people gathered in Jerusalem for the opening ceremony of the U.S. Embassy. Simultaneously, about 60 miles away, Gaza suffered its deadliest day in years as Israeli soldiers opened fire on Palestinian protesters. But have these developments really changed anything in the Israeli-Palestinian conflict? Demands have stayed the same, impasses between the different sides have been highlighted and the United States' role in future peace talks appears to be shifting. Take a look at a map of Israel. It sits snug between the Jordan River and Mediterranean Sea. Sections of land carved out of its eastern and western sides mark the Gaza Strip and the West Bank, home primarily to Palestinians. Lines around those areas are etched into the ground in the form of fences and barriers that are heavily guarded by Israeli security forces. Many Palestinian areas are poor, some of them desperately so. In Gaza, sewage spills into the sea, electricity is unreliable and unemployment is high. It's under a blockade imposed by Israel and Egypt that's had a devastating effect on the area. According to the United Nations Relief and Works Agency, years of conflict and blockade have left 80 percent of Gaza's population dependent on international assistance. Farther east, the West Bank is much larger than the Gaza Strip, and perhaps an even bigger conundrum for potential peace talks. Israel captured the land in a 1967 war and has occupied it ever since. Palestinians want the West Bank to be part of a future Palestinian state. But critics say the growing number of Jewish settlements there are dividing up Palestinian populations and will make it hard to create a state with contiguity. And then there's the disputed city of Jerusalem. Israel claims the city as its capital. The Palestinian Authority has said it wants the eastern part of Jerusalem for the capital of a future Palestinian state. Now, the Trump administration has officially backed the Israeli claim — breaking with decades of U.S. and broad international policy — and solidified its support by moving the U.S. Embassy to Jerusalem. 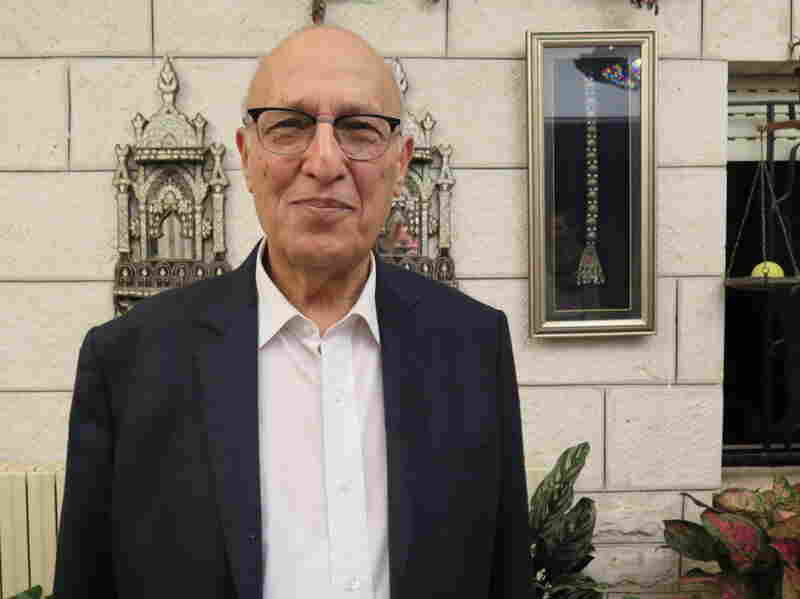 Nabil Shaath, a senior Palestinian official and adviser to President Mahmoud Abbas, is sitting in a home in an area Israel considers part of municipal Jerusalem, near a separation barrier along the West Bank. He recalls his days of teaching at the Wharton School of Finance in Pennsylvania — and a student there he believes was a young Donald Trump. Shaath says now-President Trump has been a "catastrophe" for Palestinians. Nabil Shaath, a senior Palestinian official. "[Trump] is very much siding with the Israelis," Shaath says. "Moving his embassy to Jerusalem was nothing [more] than a demonstration of his alliance with the Israelis." Shaath noted the United States has been close with the Israelis in the past but says this time is different. Previously, the U.S. government didn't recognize Israel's control of East Jerusalem and said the status of the city should be determined in negotiations between Israelis and Palestinians. "These were part of the deal which kept us accepting the role of the Americans," says Shaath. Now, he says the Trump administration has violated possible negotiated solutions for Jerusalem, including an idea to partition the city into East Jerusalem for the Palestinians and West Jerusalem for Israel. "At the heart of any negotiation, Jerusalem was key," says Shaath. He says President Abbas now believes the United States can no longer play a leading role in negotiations. "What Mr. Abbas is saying is I don't want America altogether [...] to be the owner of this peace process." The Trump administration has cited biblical and historical reasons for its policy changes around Jerusalem. The government argues that recognizing the city as Israel's capital will remove the issue from the negotiating table of potential peace talks. But it also says the city's final borders are subject to negotiation. 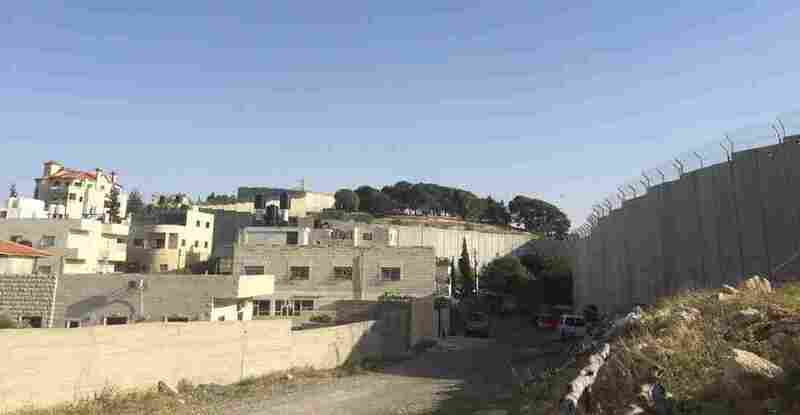 A few miles northeast from the new U.S. Embassy site, past Jerusalem's large concrete separation barriers, is Abu Dis. There have been unconfirmed reports in Israeli and U.S. media that the Trump administration has considered the town for possible negotiations over a Palestinian capital. But residents there tell NPR they still have their sights set on East Jerusalem. A view of the Palestinian town Abu Dis and the barrier that separates it from Jerusalem. "[Trump] came and destroyed our dream of having East Jerusalem as our capital," says Ali, a Palestinian man who grew up in Abu Dis. He only gave his first name out of security concerns because of ongoing Palestinian protests in the area. "I'm saying East Jerusalem because I would recognize West Jerusalem as a capital in a two-state solution." For decades U.S. administrations have pushed the Israelis and Palestinians to agree on establishing two neighboring states for their people to bring lasting peace to the region. But now, U.S. Ambassador to Israel David Friedman says, while the U.S. would support such an agreement, it's not something the Trump administration is calling for. "This is a decision that Israel has to make for itself and in conjunction with its negotiations with the Palestinians," Friedman says. Diana Buttu, a lawyer who advised the Palestinians in past peace negotiations, does not believe a two-state formulation will ever work. Instead, Buttu supports a proposal of one state with equality for all individuals — a formulation that could end the idea of Israel as a Jewish state. "When you're constantly privileging one group over another then it's not a recipe for peace. It's actually a recipe for continued conflict," says Buttu. 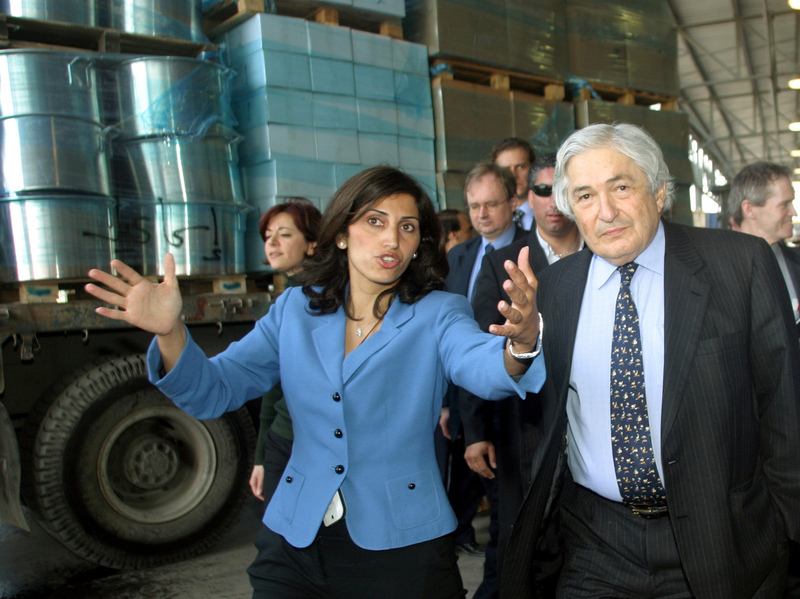 Diana Buttu seen in 2005, when she served as an adviser to a Palestinian cabinet minister, accompanies then-World Bank President James Wolfensohn, during their a tour of the Gaza Strip. She says the alternative to a two-state solution is "putting sanctions on Israel and telling it to get out of the West Bank and the Gaza Strip." She also questions the timing of President Trump's Jerusalem decision. "Why did he have to do this now when it's not going to yield any positive benefits?" Buttu asks. In Gaza, Ahmed Abu Artema stares longingly into the distance, across the fence that walls Gaza off from Israel. Artema describes Gaza as a prison. It's home to nearly 2 million people on a strip of land about the size of Detroit. "We cannot go. We cannot live like other people," says Artema. "So what if this fence was removed and we could go free?" Ahmed Abu Artema is an organizer of the Palestinians' weeks-long protests at the Gaza border. Artema dreamed up the idea of the recent protests called the Great March of Return. The goal was to call for Palestinians to be able to return to the homes their ancestors lost 70 years ago with the creation of Israel. Throughout the protests, people in Gaza surged to the fence barring them from Israel — some carrying wire cutters to clip away pieces and break through. Artema says the protests are one link in a chain in Gaza's struggle for freedom — a struggle he says is going to take time. 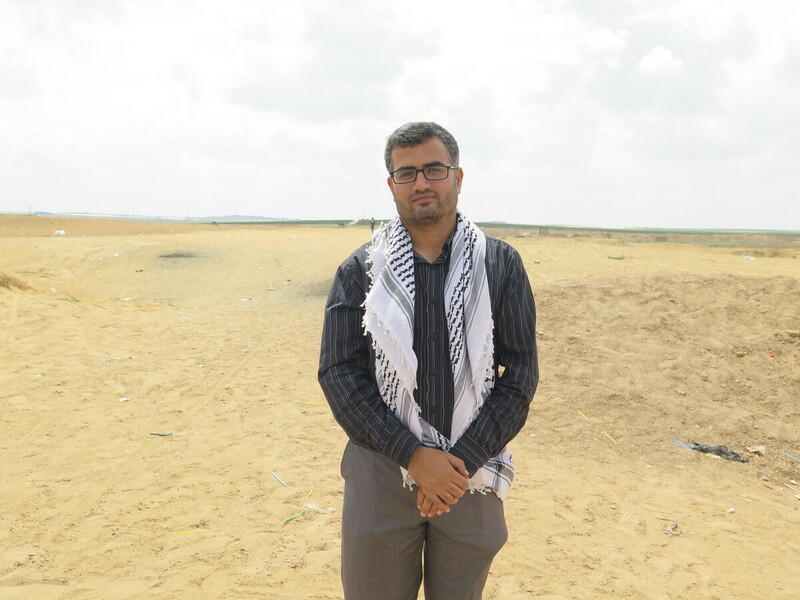 "The March of Return reminded the world again that there is this extraordinary situation in Gaza; this is abnormal," says Artema. After A Deadly Day In Gaza, What Are Palestinian Protests Accomplishing? The Islamist group Hamas threw its weight behind the demonstrations. It has held power in Gaza since winning elections in 2006. The Israeli military accused it of using protesters to carry out acts of terror. Monday brought a major day of protests that resulted in the deadliest day in Gaza in years. Israeli soldiers shot live rounds at protesters, killing more than 60 people, according to Gaza health officials. As the protests raged, Israeli Prime Minister Benjamin Netanyahu took the stage at the U.S. Embassy opening ceremony. He expressed gratitude to President Trump and also thanked Israeli soldiers who were "protecting the borders of Israel as we speak." Meanwhile in Gaza, Artema said he felt sorry for anyone who gets killed or injured, "but these people are actually knocking on the walls of their prison cells. They do not want to stay there anymore." NPR's Steve Inskeep contributed to this report in Jerusalem and Gaza.